(Newser) – For decades, conspiracy theorists have claimed the famous "backyard photo" of Lee Harvey Oswald, which shows him holding the same type of rifle used to assassinate JFK, is a fake—a claim that Oswald himself made when he was arrested. But thanks to a scientist who has studied this photo before and stated previously it was "highly improbable that anyone could have created such a perfect forgery with the technology available in 1963," that claim has now been debunked. A new study out of Dartmouth, published in the Journal of Digital Forensics, Security, and Law, used sophisticated 3D imaging technology to analyze key details of the photo, including Oswald's pose, and found that the photo is indeed authentic, a press release notes. "Our detailed analysis of Oswald's pose, the lighting and shadows, and the rifle in his hands refutes the argument of photo tampering," Hany Farid, the study's senior author, says. I'll say now what I said then. Show me the negative. Here's what conspiracy types need to understand: in order to replace the prevailing narrative, you have to offer an alternative that better explains the facts. Conspiracy types have had more than 50 years to offer a viable alternative theory and they've failed in that endeavor. If Lee Harvey Oswald didn't kill Kennedy, then who did? 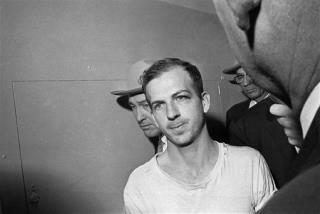 If Lee Harvey Oswald wasn't acting alone, then who was helping him? Until you're prepared to answer those questions, STFU. I been into photography, both as a hobby and a business for many years. The only way that lighting would be correct is if we had two suns.